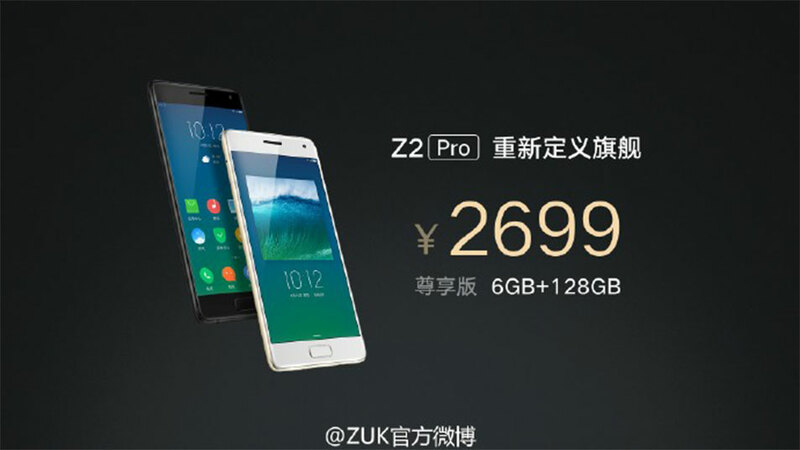 ZUK, sub brand of Lenovo, has released Z2 Pro, which is the successor of last year’s ZUK Z1. Currently the phone is released only in China with a price tag of CNY 2699 (Rs. 27,500 approx. ), but soon it will be launched globally. The phone will be available in two variant, one with 6GB RAM and 128GB internal storage, while other will be 4GB RAM with 64GB internal storage. The onboard storage is limited to the mentioned space above, as it does not has support for memory card. The 6GB model will be on sale from 22nd April, while the 4GB version will be available from 10th May. Z2 Pro is a flagship device from ZUK with the latest hardware specifications and features. It is powered by Snapdragon 820 Quad core processor which is clocked at 2.15GHz accompanied with Adreno 530. As mentioned above, the high-end variant comes with 6GB RAM and 128GB onboard storage with no support for micro SD card. The device runs on Android Marshmallow with ZUI 2.0 UI over the top. Z2 Pro features a 5.2 inch full HD Super AMOLED display with a resolution of 1920 x 1080 pixels. The build quality of the phone is top-notch with mere 7.5mm thickness and weighs only 145 grams. It has metallic body with 3D floating glass design. ZUK Z2 Pro is equipped with 13MP primary camera which has features like auto-focus, f/ 1.8 aperture and dual tone LED flash. It also comes with a powerful 8MP front camera which can capture videos at 1080p. The device is backed with huge 3100mAh battery which has support for Quick Charge 3.0, which can charge 83% battery in just 30 minutes. The phone is available in two colors, i.e. Titanium Black and Ceramic White. The other features include Fingerprint sensors, Type-C USB port, Wi-Fi, Bluetooth v4.1, GPS, heart-rate sensor, dual SIM support, 3G, LTE and 3.5mm audio jack. The 6GB variant of Z2 Pro is priced at CNY 2699, while the price of 4GB variant is still not revealed. Other devices with similar price tag and specifications are LeEco Le Max 2, Meizu Pro 6, and Vivo Xplay5 Elite. To get more updates on upcoming ZUK smartphones, stay tuned with us.